Athens: Clearlake Shipping (Singapore), part of Gunvor, has extended its existing timecharter of a capesize bulk carrier operated by NYSE-listed Diana Shipping by a further 22 to 26 months. The Boston (177,828 dwt, built 2007) has been fixed at a gross rate of $13,000 per day, minus a 4.75% commission paid to third parties. The extended charter period is expected to commence on August 9, and should generate around $8.4m in gross revenue during the initial 22-month period of the charter. The rate is a reduction on the gross daily rate of $14,000 locked in when the Boston was originally fixed in July 2013 for a minimum of 24 months. 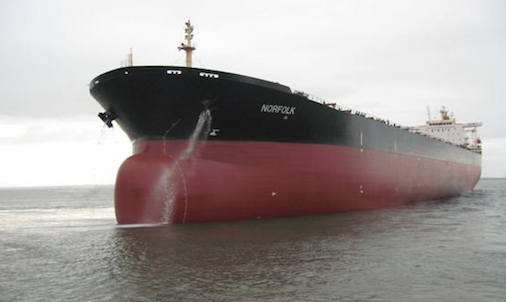 Clearlake currently has one other capesize, Norfolk (164,218 dwt, built 2002), on timecharter from Diana. The trader extended the vessel’s contract in February for a gross rate of just $10,250 per day. The Singapore-based Gunvor subsidiary also has two kamsarmaxes on timecharter from Diana, being the new Medusa (82,194 dwt, built 2010) and Myrsini (82,117 dwt, built 2010).